Here's a movie for those of you who thought Before Sunrise needed way more monsters. To general audiences or people who don't like the genre, all horror movies are the same -- naked teenagers, rubber monsters, blood-soaked gore. Horror gets unfairly stereotyped not according to any movie these people have seen but just the things they've decided they don't want to see. Those of us that know and love horror, though, have seen the genre's ability to act as a larger umbrella under which all kinds of different stories can be told -- comedies, westerns, coming of age dramas, you name it. 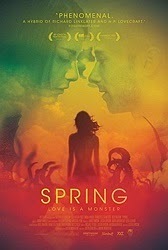 Spring, the new horror film from the directing team of Justin Benson and Aaron Moorhead (the pair responsible for Resolution in 2012 and the "Bonestorm" sequence in last year's V/H/S: Viral), isn't just a horror movie. It's a beautiful and deeply felt romance -- one of the best I've seen in recent years. Lou Taylor Pucci (Evil Dead) stars as Evan, an American who has just lost his mom to cancer and has to disappear when a bar fight has him sought after by both the cops and the guy he beat up. He takes off for Italy, where he gets a job working on a farm and meets Louise (Nadia Hilker), a beautiful woman with whom Evan immediately hits it off. But Louise is hiding a secret that she's more than seems to be. Like their previous feature Resolution, Benson and Moorhead fill the majority of Spring with two characters talking. And, like Resolution, they tease out the story's more supernatural elements slowly and totally effectively -- we know something is going on, but we're not sure what. Thankfully the characters and performances are compelling enough to maintain our interest even if the genre stuff wasn't. Pucci, an actor who has too often been cast as oddballs or character parts, is more natural and likable than he's ever been on screen, while Nadia Hilker is a real-deal find (she's apparently done a lot of German TV; this is her first theatrical feature). Their chemistry together works in such a way that I could just have easily seen a movie entirely about the two of them meeting and falling in love in Italy -- and, yes, it would pretty much be Before Sunrise, but is that such a bad thing? Indeed, Spring would be a great relationship movie even without the monster stuff. With it, the film becomes a metaphor for the baggage we bring into new relationships and the things about ourselves we must be willing to give up to make it work. It's a movie about death and how our awareness that our time is finite governs our behavior -- that even surrounded by constant loss and decay, we can still find beauty (pay attention to all of the plant and bug imagery, much of which is on the heavy-handed side). When Benson's screenplay begins explaining the specifics of the monster stuff, it breaks a bit of Spring's spell. It's a necessity, I suppose, and ties in directly to the way the final act plays out, but does bog the film down in plot and exposition when it has previously been about mood and performance, lovely location photography by Moorhead and the gorgeous score by Jimmy Lavalle. The exposition interrupts the movie in the same way it interrupts Louise and Evan's story. I'm guessing that's no accident. As audiences for all kinds of media continue to splinter off -- everyone has to identify with his or her thing -- labels are becoming increasingly important in how movies are made and marketed. I can be guilty of this, too; as a genre fan, I can get too easily get caught up in categorizing things. Spring isn't a movie that defies categorizations so much as it just doesn't care. It's a horror movie that's also incredibly romantic, or it's a beautiful love story which happens to feature some monsters. Benson and Moorhead aren't sneaking monsters into their love story nor are they turning their backs on horror by making a traditional romance. The two things are inextricably linked, cycles of life and death and the things in between that make it all worthwhile. Just in case you don't think we're living through another golden age of horror (specifically independent horror, as most studio horror is pretty worthless), consider the fact that Spring is hitting theaters and VOD just one week after It Follows, the fantastic and relentless new film from David Robert Mitchell. When Jeremy Gardner, the writer/director/star of the brilliant indie horror The Battery, shows up for a small but effective role as Evan's best friend, it's more than a case of good casting for a part. Seeing Gardner is yet another reminder of what a vibrant and varied landscape there is in the genre right now, and what amazing talent there is popping up in so many of the movies I've loved in the last few years. Spring is wonderful. It's great to look at, features two terrific performances, is carefully observed about attraction and first love. Drafthouse Films, who are releasing the movie, continues their spotless record of finding and distributing interesting, original films from exciting new voices. Benson and Moorhead have taken another leap forward, learning from Resolution and making a movie that's more universal but no less idiosyncratic. It's a beautiful horror film and a first-rate romance. Yes, we're all going to die some day. In its way, Spring makes us feel better about that. Spring is currently playing in limited release and on VOD. Patrick, I watched this over the weekend and thought the exact same thing especially the comparison to "Before Sunrise". This was a great example of a half a year or more of anticipation paying off. There were a couple small things that happen that I could nitpick, but there's no need. Overall it was a really enjoyable film (although I still don't know why he was interested in her. To me, her character was kind of unlikable.) They are 2 for 2.5 (I don't really count V/H/S) with me so far. I still like "Resolution" better, but Spring shows a huge step forward in the maturity of the filmmakers. This has been on my list since I first read about it. I love stories that blend genres, or start off as one type of tale before veering slowly, but naturally, into something else entirely. I can't wait to see this. I haven't even read the review, but I nearly died laughing at your lead line. "You know what would have made that Before Sunrise movie better . . . "
Personally, I think just about every movie could be improved with the addition of monsters.